The Paris-based Le Figaro newspaper reaches more than 24.2 million French people every month via its print and digital media. Under the direction of veteran news editor Alexis Brézet, a team of 350 journalists produces more than 450 articles and 130 videos every day that act as a major reference of online information in the French language, including current affairs, economics, politics, lifestyle, sports culture and more, in France and across the globe. The volume and quality of the Le Figaro’s journalism has made it the most quoted media brand in France, receiving 2,400 quotes per month in TV and radio. 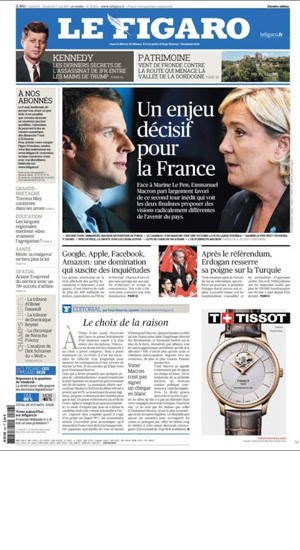 The newspaper has embraced the digital age, gaining 3.6 million members on its social media accounts, and its webpage LeFigaro.fr has over 1 million Figaro Connect users, who personalize their experience with comments, which are left on articles on average of every six seconds. The FP’s website reaches 4.41 million readers monthly, with the average unique visitor spending 4.8 minutes on the site, more than double the time readers spent on ForeignAffairs.com and Economist.com. Meanwhile, a solid portion of the magazine’s readership are professionals in the US that hold responsibilities in operations or decision-making positions of their companies. This professional audience gives the FP access to a high-income social class: About 48% of the magazine’s readership were surveyed to have a household income of over $100,000. In 2000, a format change was implemented from a slim quarterly academic journal to today’s bi-monthly magazine, which was followed by a launch of international editions in Europe, Africa, the Middle East, Asia and Latin America. The format change has proven successful in raising engagement, with 87% of readers now spending an hour or more reading each issue. The FP is one of the most distinguished medias in the US, having won 3 National Magazine Award, 5 Folio Magazine Eddie Awards for Editorial Excellence, an Overseas Press Club Award, and a Military Reporters and Editors Award for Best Content. China Daily has the widest print circulation of any English-language newspaper in China with 900,000 paid copies per issue. The website (www.chinadaily.com.cn) is viewed by 56.4 million people every day and gets about 8.19 million unique visitors daily. China Daily is an authoritative provider of information, analysis, comment and entertainment to global readers with a special focus on China. 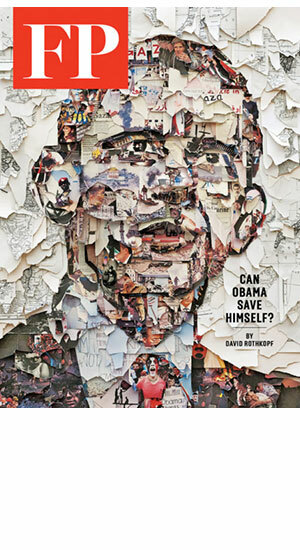 It uses cutting-edge design with dynamic pictures and artwork; and encompasses in-depth reporting and analysis. 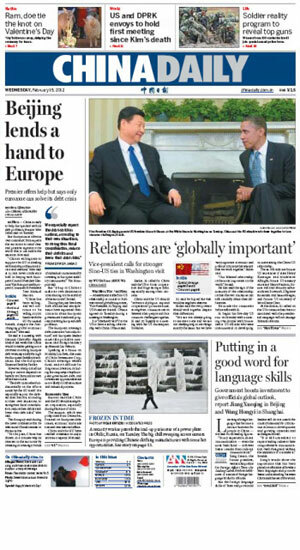 China Daily readers tend to be cosmopolitan, well-educated people, both in China and abroad. They include elites such as government decision-makers, politicians, ambassadors and other diplomatic personnel, senior executive of Chinese & international corporates, as well as experts and scholars. China Daily’s special reports are an extension of its news coverage and are read by its 900,000 subscribers and on-line readers. They feature in-depth reporting and broad coverage with a flexible design, which allows us to better meet our client’s needs and satisfy readers demand for diverse and sophisticated content. China Daily’s web TV show is Global Talk that features communications with other countries and interviews with national and international politicians, industry executives and other major global players. It gives a powerfull video content to the broad audience. 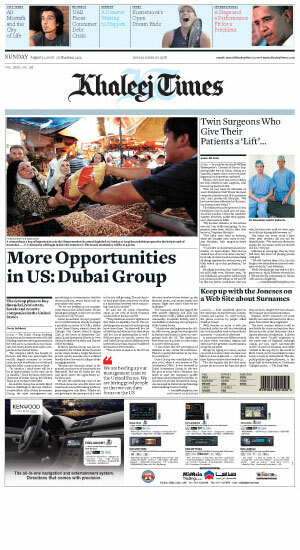 The Khaleej Times is a reference English-language business newspaper in the Persian Gulf. It shapes the opinions of business readers, decisions makers and government agencies and establishments in the U.A.E and the GCC. Reaching out to more than 450,000 readers, the Khaleej Times was the first English newspaper to be launched in the UAE in 1978. With over 30 years of dedicated journalism, it has become a trusted source of business intelligence throughout the Gulf, distributed in Bahrain, Oman, Kuwait, Qatar, Saudi Arabia, along with Pakistan and India. The Khaleej Times supplements are an integral part of UAE newspaper culture and are recognised for their high quality writing and research. The publication is accessible on the website www.khaleejtimes.com. The online version reaches out to a targeted readership both at home and abroad; it has carved its own niche brand equity and is among the Middle East’s most visited websites. The debut of the English edition of Global Times in April 2009 establishes a new reliable channel for Chinese people and the rest of the world to understand one another. The paper is one of the most dynamic players among Chinese media, and has rapidly become a major English newspaper in the nation. It is today China’s newspaper with the largest in-flight circulation: 50,000 copies per day, covering over 300 routes of 10 domestic and foreign airlines. The Global Times English edition cooperates with luxury hotels in 20 cities across the country to issue 30.000 copies per day. The newspaper has proved a popular platform among our business readership. 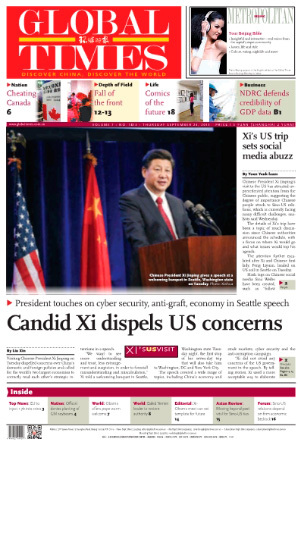 The Global Times English edition is printed simultaneously in Beijing, Shanghai, Guangzhou, Wuhan and Xi’an, covering the regions of the entire country. Our strength ensures our authoritative reports. There are more than 500 special correspondents and contributors working for Global Times throughout the world. Their front-line interviews and reports create the unique and comprehensive voice of the Global Times. The Global Times’ readers, include Chinese Government officials, policy-makers, business executives, politicians, and intellectuals. China’s top universities use the newspaper as a teaching tool for the nation’s future elite.